It was only after a full decade of being a professional chef that Shigeo Akiba felt confident enough to level up in his culinary game. And for him, that meant becoming a dashi master. So for another 10 years, the current head chef of Nami, a Japanese restaurant located at Shangri-La Hotel Singapore, trained and soaked up all that he could to perfect his skills in preparing the perfect “broth of life”. Udon cooked in Niban Dashi, Saba Dashi and Urume Dashi, then placed into chawanmushi and steamed with niban dashi, shoyu, sake and mirin. Many have said that in Japanese cuisine, all roads lead back to dashi. It is a base that lends dishes, including miso soup, donburi and chawanmushi, that unmistakably umami taste. Forget the gaucherie use of artificial powdered MSG (short for monosodium glutamate) to achieve the much-loved “meaty, mouthful” flavour, dashi is made by extracting the natural acids from seafood and vegetables, not only promoting the consumption of nutritious foodstuffs but offers a more intricate palate too. It is said that in a dashi, you can get eight times the umami effect, a taste that’ll truly feed your soul. Furthermore, according to Nutritional Neuroscience, a global nutrition journal, daily intake of dashi has been shown to improve mood status. Chef Akiba makes his dashi in the traditional way that was taught to him by Masami Honda from Nadaman, Yokohama. He said he only received two compliments from his mentor Honda throughout his 1o-year apprenticeship. No doubt, the process of making dashi is a daunting one. It’s time-consuming and utterly complex. Quick judgements must be made, from heating and timing, to the scrutiny of the quality of seasonal ingredients. The most basic of dashi (called Ichiban Dashi) is made by brewing ‘kombu’ (kelp) and ‘katsuobushi’ (dried, smoked bonito fish). Though that sounds deceptively simple, the flavour nuances and duration of simmer (never a boil) of each ingredient for the required taste, aroma and colour is crucial to the resulting product. In cooking dashi, the priority is to produce consistency, hence the long training. Dashi Masterclass at Nami Restaurant Bar with chef Shigeo Akiba, who is a dashi master. It’s also quite astonishing to find out there’s actually a multitude of different kinds of dashi. At Nami, the Japanese chef makes eight types. There’s the base broths, Ichiban Dashi or ‘The First Brew’, only used in clear soups; and Niban Dashi or ‘The Second Brew’, the most commonly used, as it complements most of the dishes in Japanese cuisine. It also acts as the base for other dashi with added ingredients. Yet, other single-ingredient dashi exists. Jako Dashi, made from dried baby sardines, has aromas of the fish yet is subtle in flavour; while the seldom-seen Saba Dashi, made from dried mackerel, has been used for making dipping sauce for soba noodles. Experience firsthand the different nuances of this broth as Dashi Master Shigeo Akiba conducts a Dashi Masterclass every last Saturday of the month at Nami. Peek into the in-depth craft and have a renewed appreciation of the water-rich dish through a structured programme, similar to a wine-tasting workshop. Yes, you’ll even get to sip dashi in a wine glass. The class ends with a four-course set lunch. 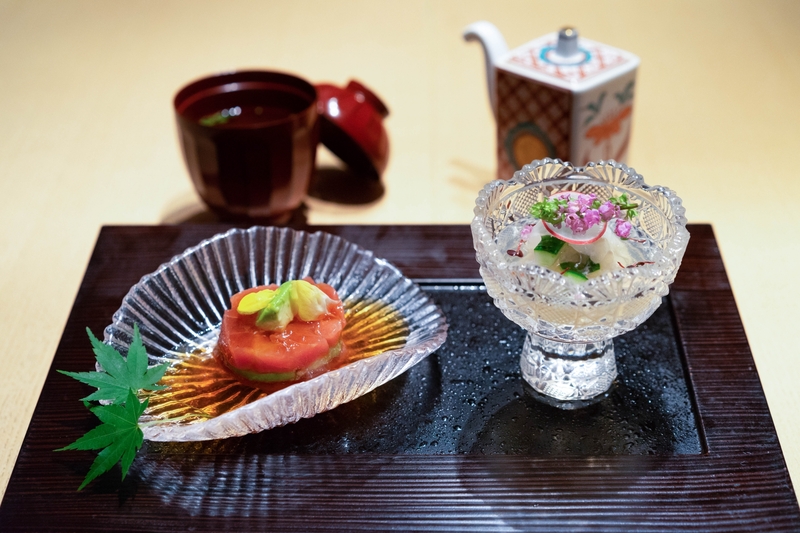 Nami has also unveiled a special menu that serves dashi-centric dishes, from appetisers dipped in Niban Dashi to udon cooked in a triple-dashi-mix. Even dessert comes in a — ahem — dashi-ngly good cocktail of fruits and plum vinegar jelly with dashi.